A classic reborn with even more power. The Limitless Mod Co 200W is back, dubbed the limitless classic. The classic is back with even more power for those looking to up the ante, 220 watts to be exact. The new classic also features brand new side plate dsigns, cast and machined from a unique resin blended swirl. Eye-catching to say the least, the new limitless mod CO classic will easily be a favorite many will enjoy. I prefer the LMC 220W Classic Box Mod more than the LMC 200W Mod. Different people have different ideas. Some like the retro and faded style of LMC 200W whose most distinguishing feature is the intense design feeling in her paintings. Now, ave40 offer 8% off for this classical mod, hurry in! Shocking new coming! 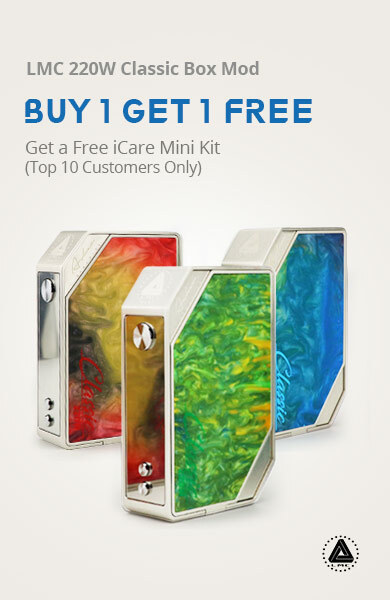 Once you order an LMC 220w Classic Mod, you can get a free ICare Mini Kit.